It's much easier to watch and learn how to make an arm knit blanket, so follow along with our video! I recommend pausing and replaying the casting-on portion of the video, since that's the step I personally had the most difficulty learning how to do. If reading instructions is more your style, keep scrolling! Four skeins of chunky yarn - I'm using Bernat Blanket Extra for my arm knit blanket, and I'm doubling up and using two skeins at the same time. If you want to use a lighter-weight yarn, you may have to triple up your yarns. 1. Pull out 20 feet of both strands of yarn. The amount of slack yarn you give yourself at the beginning is dependent on the size of the blanket you want to make, and the weight of your yarn. For two strands of this chunky yarn at 34 stitches in width, I used 20 feet of slack yarn. 2. Tie a slip knot at the 20-foot mark. If you are unfamiliar with the slip knot, don't worry - it's really easy. I recommend watching this short 50-second video to learn how. From here on out, I'll refer to the extra 20 feet of yarn as the "slack yarn," and the balls of yarn as the "working yarn." 3. Feed your right arm through the slip knot. You want it to be tight, but not too tight, since the slip knot will have to be large enough to fit around your elbow and upper arm. 4. Now to set up your left hand to cast on. Loop working yarn around left thumb, grab tail of working yarn, and hold with ring and pinky fingers of left hand. Grab the slack yarn, and pinch it between your pointer and middle finger on your left hand. Rotate your right arm towards yourself. Feed right hand down through the loop on your left thumb. Tighten working yarn, but not too much! Now you've cast on your first stitch! 6. Cast on 34 stitches. Move the yarn up your arm as you work, making sure your stitches aren't too tight or too loose. 7. Grab the working yarn in your right hand. With your left hand, pull the first loop on your right arm over your right hand. Turn the loop in your right hand towards yourself, and feed your left hand through. You've just completed the first stitch of your arm knit blanket! 8. Do 34 stitches, until you've used every loop on your right arm. 9. To move on to the next row, repeat step 7-8, using opposite hands. I.e., grab the working yarn in your left hand, and complete the action with your right hand. 10. Continue steps 7-9 until you've completed a total of 34 rows. The whole process should take about an hour. 11. When you're ready to cast off, start with two normal stitches. Pull the first stitch on your right arm over your right hand. Do a normal stitch, and pull the first loop over your right hand again. Repeat for the entire row. When you get to the end, trim your yarn, leaving a few extra inches. Pull the last loop all the way through, which will create a knot at the end. 12. Weave in any loose yarns with a crochet hook, or by hand. 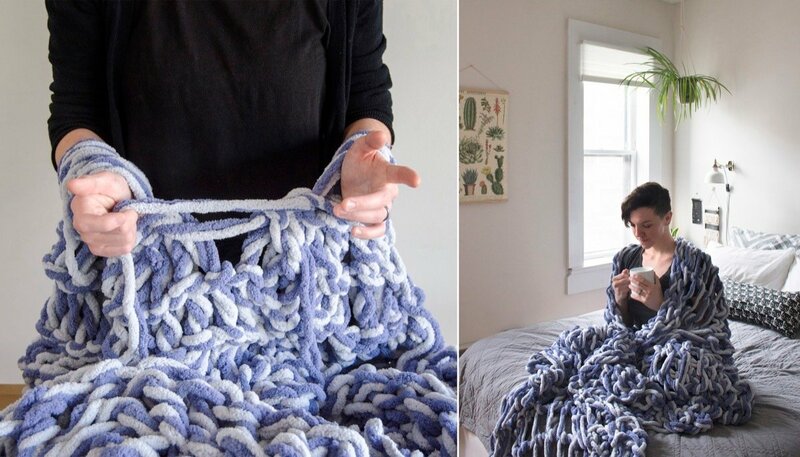 Cuddle up in your DIY giant knit blanket and admire your handiwork! Share this fast-craft on Pinterest! 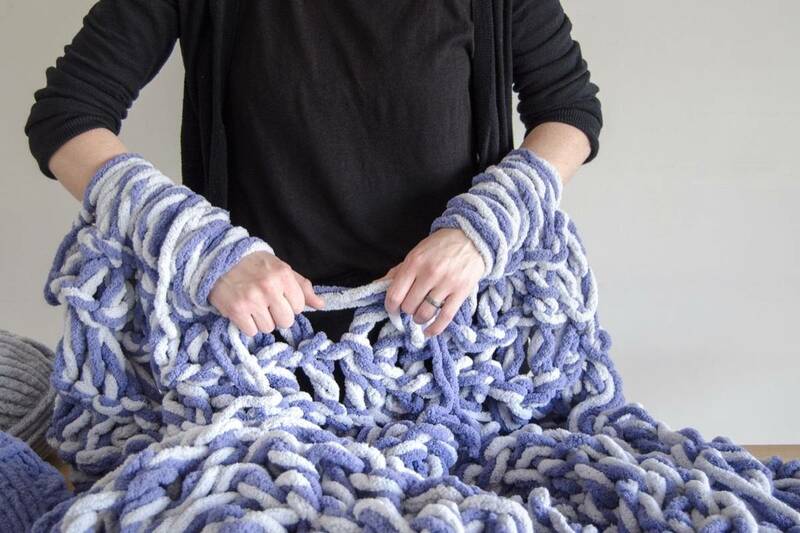 So, think you'll try your hand -- I mean arm -- at making an arm knit blanket? With the holidays right around the corner, it's a fast, easy, and affordable way to give a handmade gift to show someone you care. Happy arm knitting! If arm knitting isn't your style, but you still want to stay warm this fall, check out this tutorial for making a cuddly flannel throw blanket.